Allows flying of any Tx-R models from Hobbico from most any TX with the correct adapter. 1 adapter cable. 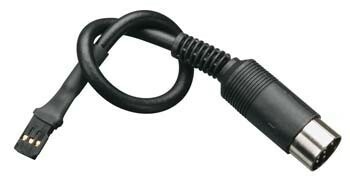 Fits trainer port on Hitec , Futaba and Tower radios with the round multi pin trainer port. 1 adapter cable. Fits trainer port on late model Futaba radios with the square trainer port. 1 adapter cable. Fits trainer port on JR and Spektrum brand radios. 1 adapter cable. Fits trainer port and provides power for Spektrum models in title above. Includes 2S 7.4v 200mah lipo. 1 adapter cable. Fits trainer port and provides power for Futaba models in title above. Includes 2S 7.4v 200mah lipo.